Got a new toy this week. It's the Google Chromecast thingy. I haven't spent the entire week evaluating it; I have another project going on that's taking up a lot of time, but I did manage to get a good test of the Chromecast. Now, just as a reminder, I do the Internet TV thing. Though I do have an antenna, I don't have cable or satellite, and most of my TV viewing is via the Internet. Not on my computer. There are lots of people that do that. I think Frank J. does. I don't use a computer; I use other devices to get content to my TV. I use Roku, Apple TV, TiVo, Simple.TV, and Xbox 360. Do I need all that? No. Nobody needs all that. But I got it anyway. Mostly because I felt like it. Or, I wanted to try something out and kept it. That's where I am on this new toy. It's called Google Chromecast and it's a slightly different take on things. 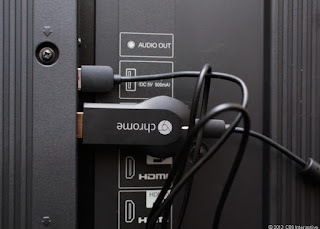 While the other devices primarily make connection with the streaming services (Netflix, Hulu Plus, Amazon, iTunes, and so on) the Chromecast doesn't. It allows your TV to receive a stream from one of your other devices, like a smartphone, a tablet, or a computer. And, I'm gonna tell you my thoughts about it. Okay, maybe I need to say a little more about it. Well, it's a simple little device. You can click the image at the top and get an idea of how big it is. Or little. It plugs into an HDMI port on your TV, and you can use your computer browser, or a smartphone or tablet to set it up. Now, you can't set it up using a Kindle Fire. At least, I couldn't. Most other Android-based tablets will work, though. You can use an iPhone or iPad. There's an app for it. Or, you can use your computer and the Chrome browser. The box comes with simple instructions on how to set it up. You can simply plug it in, attach the power cord, and set your TV on the HDMI port and the instructions will appear on the screen. Do exactly what they say and you'll be just fine. About that power cord. You can use the included wall wart power adapter, or if your TV has a USB port (not a service port, but one labeled "USB") that will power it. Be advised of one thing: on one TV I tried it on, the power saver feature turned the USB power off after a while, meaning I had to remove it and plug it back in. Using the wall wart solved that. Your TV may not do that, and using the USB port keeps things tidier. The good: It works. Using the Netflix app on iPhone and Kindle Fire, or the Netflix Website using the Google Chrome browser, a "Play On" button appears that lets you send the output to the Chromecast. And, that means it plays on your TV, both picture and sound. Right now, Netflix, YouTube, Google Play, and Google Chrome are the only apps that will send content, but that actually covers a lot. I was able to send Hulu content using the browser. Not just Hulu Plus content (which is all Roku, Apple TV, and other set-top boxes support), but also Hulu standard free stuff. The stuff you can't watch on set-top boxes. And, you can send a lot of stuff via the browser, so in that respect, it works pretty well. Also, if I send an app from my tablet to Chromecast, say Netflix, I can still check email such. There may be something that will interfere, but so far, I haven't run into anything. The bad? Well, it doesn't do true mirroring. For instance, using Apple TV and a Mac from the last two years, you can mirror your desktop on your TV. With Chromecast, you can send content from a browser tab, but that's about it. There is no full desktop mirroring with Chromecast. The other thing is the fact that I have to have a separate device. That is, it's not that I can send stuff from my browser, my phone, or my tablet, but I have to; that's the only way I can get content to it. With Roku, Apple TV, or such, I don't have to break out my phone or tablet; those set-top boxes connect directly to the streaming source. at allunless you have disabled Silverlight. Using the default Silverlight plugin, I can mirror the browser tab, but there's no sound, and full-screen simply does not work. So, it's either not fully baked, or it's not fully supported.Using Flash, it streams fine. Still, for the price ($35) it's a pretty good setup. It's a cheap way to start watching streaming content on your TV, without having to string wires across the room. Would I recommend you get one? Well, I won't recommend you don't. It does work well, and the price is nice. It won't replace a Roku, or an Apple TV. But, it will supplement one. Or, it will work as an initial step into the world of Internet TV. As more apps come out, it may be good enough. So, recommend? I won't give an enthusiastic yes, but I will give a yes. Sounds nice, but will it enable my TV to watch me? I have decided to be concerned about the expense of storing all the info that the various agencies are gleaning from their surveilance of me. I try to do something exciting occasionally to keep them entertained, but, on the whole, I am quite boring. Actually, you *do* have to have a device to use AppleTV, the Roku, or any other streamer. It happens to be a remote, but the devices that attach to the television have no local controls. Expecting mine this afternoon. Also expecting it to be thoroughly enjoyed BEFORE I get home. Heh. Well, the remote comes with the Apple TV, Roku, and other devices. I think you'll like it. How much use? Probably not a lot for you, with all the other stuff you have [note to readers: he's really into the Internet TV thing in a serious way]. But, it's a useful little device. You're a lucky man, Basil. Google announced Chromecast, then promptly sold them all, while I was at work. When I heard that local Best Buys were getting them, I went to mine and asked the gentleman in the TV section if they had them. He said yes, then took me to a shelf with a gaping hold and a tag for Chromecast underneath, before muttering an obvious, "I guess we're sold out." And a few quick checks revealed that the closest store that did have one was something like 200 miles away. I really had a terrible time setting it up. Mostly because I was tired and wanted to do things MY WAY, but a little because this gem is a little rough around the edges. I could not install it with my Fire. I went to the url and Google offered to install the app, but the Fire would not install it. Then I plugged a wireless dongle into my desktop to see if that would work. I didn't try to disable the wired connection or anything -- just figured it might talk to the chromecast. It did not. My work PC did not like the unsecured network. I ended up installing with my wife's laptop. I could see the chromecast updating with the info and it appeared to connect to my home network, but the app kept reporting a failure. Finally, I just tried the chromecast app and everything worked. So, rough start. I do like it, though. Netflix and Youtube were flawless and there was very little 'lag' tab-casting (did I just make that up?). I dragged some files onto Chrome and went full screen. You can definitely watch movies this way. I have to admit that most of what I love about this is in my imagination. What it does is fun, but there isn't much of it. Given the plunge in phablet prices, I could see an android tablet serving as a sophisticated remote control or director. Chromecast Maestro has a ring to it. Tell my HDHR3 to send channel 5 to the Chromecast or Plex to send a movie. All of a sudden playlists are feasible. And why couldn't you capture that hdmi output to a computer? My college student was completely uninterested in chromecast until he got a chance to play. He wants me to hurry up and review the thing before he heads back to school...for some reason. He can take it. To be honest, 80% of my viewing is broadcast television. I love to play with these toys, but I keep waking up when the show ends. Rooted my Kindle Fire this morning. Installed Netflix and Youtube. Both stream flawlessly. No tab casting from the tablet, but I used splashtop to tab cast via my desktop using the tablet. I do not see any of the lag people talk about when tab casting. Maybe because my wireless is so good? I just upgraded to Netgear R6300-100NAS AC1750 802.11 a/b/g/n/ac Wireless AC Dual Band Gigabit Wireless Router. Playon, aereo, and filmon.com all tabcast perfectly plus I was able to tab cast from my desktop to the chromecast (I'm tab casting a movie that stuttered and sputtered on my Roku's Plex channel as I type this -- no issues). Of course, I could also open videos with chrome and tab cast from there as well. I suspect there will be a lot of chromecast enabled apps coming to my rooted kindle via the play store, but I am afraid I will have to replace the rom to tab cast.